When you finish your PCB, you can output the Fabrication Files(gerber file) via: Document > Generate Gerber, or by clicking the Generate Gerber button from the toolbar. 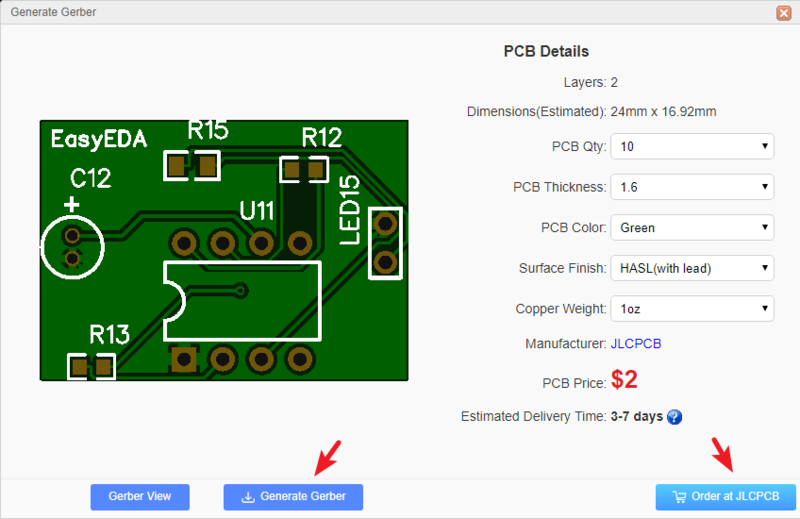 You can caculate the price for the PCB order, click SAVE to CART will go to JLCPCB and add your PCB in the cart. Gerber_BoardOutline.GKO：PCB Border file. The PCB board factory cuts the shape of the board according to this document. The groove drawn by the EasyEDA, the solid region(Type: NPTH) is reflected in the border file after the Gerber is generated. Gerber_TopSolderMaskLayer.GTS：Top solder mask. The default board is covered with green oil, and the elements drawn on this layer correspond to the top layer’s area will not be covered with oil. Gerber_BottomSolderMaskLayer.GBS：Bottom solder mask. The default board is covered with green oil, and the elements drawn on this layer correspond to the bottom layer’s area will not be covered with oil. Gerber_Drill_PTH.DRL：Plated drill through hole layer. This document shows the location of the hole where the inner wall needs to be metallized. Gerber_Drill_NPTH.DRL：Non-Plated drill through hole layer. This document shows the location of the hole where the inner wall don’t need to be metallized. Gerber_TopPasteMaskLayer.GTP：Top Paste Mask, for the stencil. Gerber_BottomPasteMaskLayer.GBP：Bottom Paste Mask, for the stencil. ReadOnly.TopAssembly：Top Assembly, read only, doesn’t affect the PCB manufacture. ReadOnly.BottomAssembly：Bottom Assembly, read only, doesn’t affect the PCB manufacture. ReadOnly.Mechanical：Record the information on the mechanical layer in the PCB design, and only use it for information recording. By default, the shape of the layer is not manufactured at the time of production. Some board manufacturers use the mechanical layer to make the frame when using Altium file to production. When using Gerber file, it is only used for text identification in JLCPCB. For example: process parameters; V cut path etc. In EasyEDA, this layer does not affect the shape of the border of the board. Before ordering the PCB, please check the gerber at the Gerber view as below. The Gerber files are generated by browser, please use the browser inner downloader to download! Before sending Gerber to the factory, please use gerber viewer to check the Gerber carefully. 2.Click the + button at the Gerbv dialog bottom-left corner, open the gerber folder, select all the gerber files, and open. 3.And then zoom, measure, check every layer, check drill holes and location. etc.